The Ntsuwa’lhkalha Tl’ákmen or the Xaxli’p Traditional Use Study was conducted by Xaxli’p community members with guidance from Martin Weinstein, and funded by Xaxli’p. The Xaxli’p mapping team asked Elders and community members, “During your entire life, tell us about how you used the land.” Xaxli’p transcribed, translated, and coded interviews for type of land use, such as plant use, hunting, fishing, as well as locations of Xaxli’p transformer legends, and Xaxli’p place names. The data was then compiled into individual “map biographies” representing knowledge held by Xaxli’p individuals, as well as thematic maps of traditional use. Xaxli’p has used a computer-based Geographic Information System (GIS) was to create digital maps. The information contained within Ntsuwa’lhkalha Tl’ákmen or Traditional Use Study is strictly confidential, and is used under supervision of Xaxli’p. We worked with Silva Forest Foundation (SFF) for more than five years to develop the Ecosystem Based Plan for Xaxli’p Survival Territory, completed in 2001. The ecosystem based plan seeks to understand ecosystem functioning and ecological limits to human activities within our territory. Through community discussions, we have blended knowledge from Ntsuwa’lhkalha Tl’ákmen and from ecosystem sciences to produce a management plan that reflects Xaxli’p values for land use. Together with the Ecosystem-based Plan, Ntsuwa’lhkalha Tl’ákmen is a guiding document for culturally and ecologically sustainable management of Xaxli’p Survival Territory. Culturally and ecologically sustainable land use means maintaining and restoring Xaxli’p cultural activities, through the maintenance, and where necessary, the restoration of natural ecological character upon which Xaxli’p cultural activities depend. Our approach meets the needs of the present generation, while providing ecologically sound cultural options for future generations. Our current focus is ecological restoration of Xaxli’p lands, so that they provide our cultural needs, and the development of a diverse sustainable local economy. Foodplants – Foodplants that are important to Xaxli’p culture include spring beauty, whitebark pine, avalanche lily, and mountain blueberry. Forest restoration and management must maintain the ecosystems that produce these valuable plants in a condition that maintains or enhances food plant productivity. Dip net material gathering areas – Xaxli’p continue to rely upon dip nets for catching fish for subsistence and trading. Small sapling-size Douglas fir trees are necessary for making dip nets. Sapling-size trees that have grown in the open are required for making bows. Forest restoration and management must provide for areas through time to provide the correct sizes and numbers of small Douglas fir saplings for dip nets, including bows. Berry picking areas – Berry picking areas exist throughout the Survival Territory. Berry picking areas change from year to year, depending on berry crop quality. Forest restoration and management must ensure that vegetation communities which support berry plants are maintained in the landscape. Snake-root gathering areas – Snake-root (Sanicula marilandica) is used by Xaxli’p for medicinal purposes, and is quite rare in the traditional territory. Ecotypes which contain snake-root must be managed in ways that maintain this resource. Fishing areas – The lower grassland and canyon areas near the Fraser River are important fishing locations for Xaxli’pmec. Some of these areas lie within the CFA. Management of non-timber forest products on these areas must not interfere with Xaxli’p traditional uses. Hunting areas – Xaxli’p hunt throughout their Survival Territory. 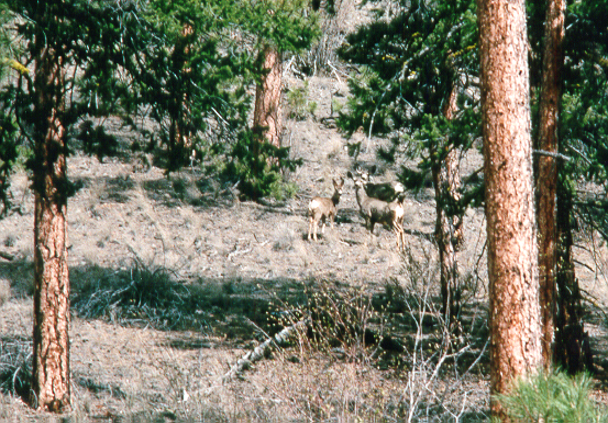 Prime species that are hunted are mule deer and white tail deer, but many other species are also relied upon. At one time Xaxli’p were able to hunt moose in their territory, but upper elevation clearcutting and unrestricted access have depleted moose populations in their territory to the point that Xaxli’p must travel to other parts of B.C. for moose. Taking direction from Xaxli’p Elders and other Xaxli’p experts, forest restoration and management will restore and maintain a variety of habitats necessary for the diversity of animals that Xaxli’p depend upon for subsistence and other cultural purposes. Traditional Trails – A long established network of trails reaches into all parts of Xaxli’p Survival Territory from the Fountain Valley. These trails have been used by Xaxli’pmec to move throughout their lands for millennia. Forest restoration and management must protect the integrity and accessibility of these trails in order to protect Xaxli’p culture. The approach that underlies our Ntsuwa’lhkalha Tl’ákmen may be found in Martin Weinstein’s articles “Getting to Use in Traditional Use” (1997) , as well as “Sharing Information or Captured Heritage: Access to community geographic knowledge and the state’s responsibility to protect aboriginal rights in British Columbia”. Culturally and ecologically sustainable land use means maintaining and restoring Xaxli’p cultural activities. We blended knowledge from our Traditional Use Study and from ecosystem sciences to produce the management plan for the Community Forest. Our approach meets the needs of the present generation, while providing ecologically sound cultural options for future generations.